We love transatlantic cruises. Because of that love we have taken an Eastbound Transatlantic cruise in 2014 and in 2015 a Westbound Transatlantic. In 2018 we did another Westbound cruise from Dover to New York City. What we enjoy so much about the cruises is that you can arrive in port a few days early and/or stay a few after the cruise and visit two completely different parts of the world. In 2014 we arrived in Orlando a day early and spent some time visiting Disney World. After the cruise, we spent a week in Rome. The 2015 cruise allowed us to spend four days in Barcelona prior to the cruise. The best part? Before or after all the sightseeing you get a relaxing trip across the Atlantic and time to enjoy the ship. We decided we wanted to spend some time in London before the cruise. Luckily for us, we have several options for direct flights to London. One problem with booking transatlantic cruises are the flights. Many mainstream airlines charge a crazy amount for one-way flights, more than a return flight, to and from Europe. Luckily, a lot of smaller airlines are flying these routes now and are charging a reasonable amount for the flights. If you have booked a transatlantic cruise, check for one-way flights using tools like Hopper, Kayak, or Google flights. Some of the airlines you should be checking are Iceland Air, Norwegian Air, Condor Air, and WestJet. Also, don’t only check flights to Heathrow, check flights to Gatwick as well. We booked a flight that left Sunday night arriving on Monday morning. That gave us 6 days to enjoy the sights of London. WestJet recently added a new route from our home airport direct to Gatwick and the flights were discounted. We also bought our flights during their birthday sale and it saved us even more. We used rewards points from our American Express to cover the cost of the flights so the three of us flew to London and home from New York for $200 out of pocket. London has a large variety of hotels in great locations and at all price points. We decided on the Premier Inn early on in the planning. They are a budget hotel chain that reviews well on TripAdvisor, and they have lots of locations throughout London. We narrowed down the areas that we were interested in staying to Southwark and in Westminster near Victoria Station. Both areas were well situated to public transit and to the sites we wanted to see. Victoria Station’s Premier Inn was in a great spot to catch the train to and from Gatwick. 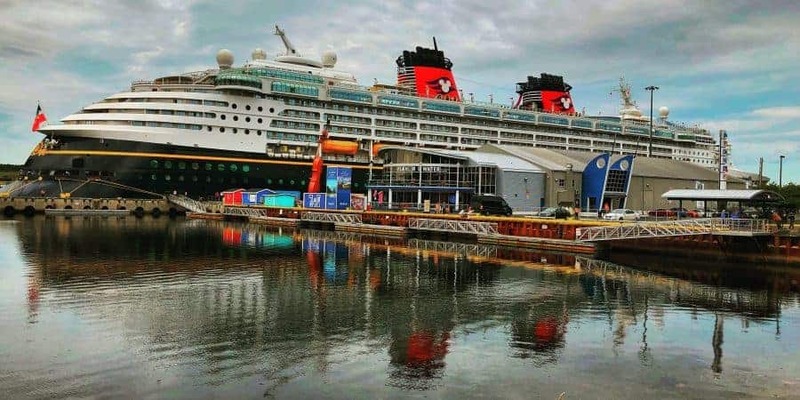 We also planned to travel to Dover using Disney Cruise Line transportation. The pick-up point for the Disney transportation was just around the corner from the Victoria Station Premiere Inn at the Doubletree by Hilton. The Southwark Premier Inns we were looking at were the Bankside, Tate Modern, and County Inn locations. All were in busy locations with lots of restaurants nearby. In the end, we decided to stay at the Bankside location. It was close to London Bridge station and beside the Borough Market. We were happy with our choice. Initially, we booked this cruise as a back-to-back cruise with the British Isles the week before. In the end, we decided we would rather spend more time visiting London and take a cruise home. By the time we booked the only oceanview rooms available on were on deck one. I was excited about trying out deck one. All reports I have read said it was very quiet and doesn’t have very much motion. However, after paid in full, a bunch of rooms opened up. Those rooms included the secret porthole room 6006 and we transferred our deck one cabin to deck six. While planning the cruise, I became obsessed with trying to only bring carry-on luggage. I was concerned about losing our luggage. We were planning on being gone for nearly 3 weeks and I didn’t want to be without luggage for that amount of time. We also always bring too many clothes on our trips and I was hoping to cut that down. I found Samsonite Underseater Luggage. It was perfect. We were able to fit all of our clothes for the trip into the luggage using compression packing cubes. I liked the luggage so much I bought one for my sister who is joining us on our cruise for 2019. We chose to not bring fancy clothes for formal night and brought mainly neutral separates that would mix and match easily. Also, we did laundry on the ship. We did end up checking one additional bag that contained our FE gifts, and other exchanges. As well as extra shoes. Find out how our flight and arrival in London went here.